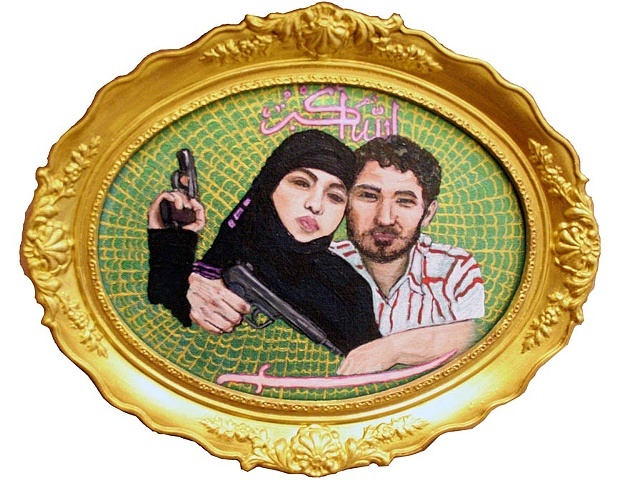 Dzhennet Abdurakhmanova, left, and her husband Islamist rebel Umalat Magomedov are shown together. 'Paradise' is the literal translation of her name. He came from the North Caucasus and was killed by Russian government forces in December, 2009. She, left a widow and already radicalised, became a suicide bomber, killing herself as the Moscow subway bomber. The March 29 2010 subway bombings killed 39 people. They are shown against a green and yellow background emblazoned with 'Allah hu Akhbar' elements of the proposed flag for the state they were trying to establish. Here the design has taken on the form of a spider's web.